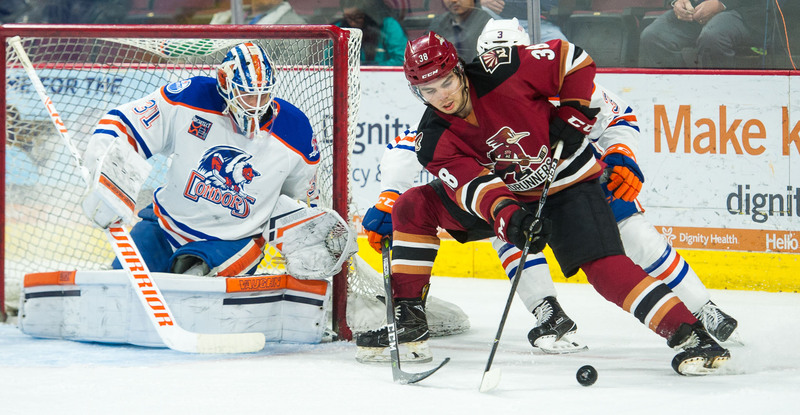 The Roadrunners earned their 10th overtime win of the season Wednesday night at Rabobank Arena, sliding past the Bakersfield Condors by a 3-2 score. Overtime has become somewhat of a trend for the team of late; they have extended past regulation in 10 of their last 20 contests. 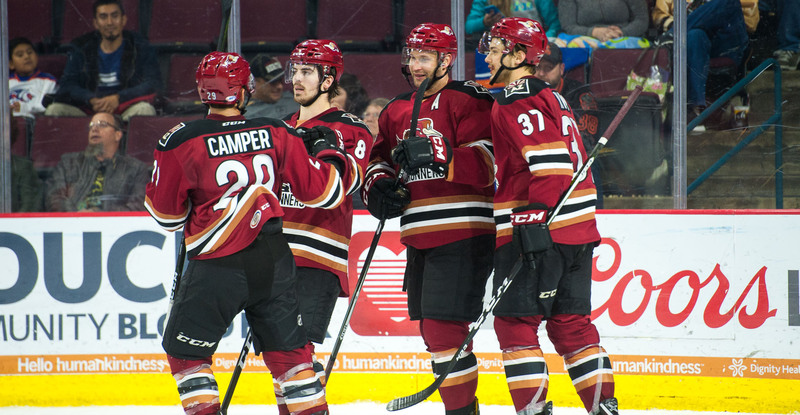 The Roadrunners had gone to overtime on just six occasions through their first 35 games of the campaign. In what was the teams’ seventh meeting of the year Wednesday evening, Bakersfield got on the board first, Joey LaLeggia giving the Condors a 1-0 lead 6:32 into the contest. A mere 11 seconds later, Michael Bunting, with an aggressive forecheck, got control of a mishandled puck behind Bakersfield’s net and fed a pass out to Mario Kempe in the slot. With the Condors’ defense scrambling, Kempe beat a vulnerable Laurent Brossoit to tie the game. In the late stages of the second period, Mike Sislo gave the Roadrunners their first lead of the night, 2-1, after receiving a wonderfully placed bank pass from Dysin Mayo to walk in to score his 20th goal of the season. Sislo’s goal also served as his 40th point of the season; it’s the fourth time in his pro career he’s reached that mark. In the third, Bakersfield’s Tye Rattie knotted the score 2-2. Tied after regulation, the Roadrunners went to overtime for the 16th time this season, and for the second time against the Condors. With possession in Bakersfield’s zone just over a minute into the extra frame, Dysin Mayo scooped up a deflected pass from Nick Merkley and fed a streaking Mario Kempe to construct the game-winning goal. Kempe, with two goals, registered his third multi-goal game of the season; he has a combined six goals in the team’s last five games. Hunter Miska stopped 19 of the 21 shots he faced to earn his 17th win of the year; he improves to a perfect 7-0 in overtimes. The Roadrunners are now 11-5 in games that extend past regulation, posting a 10-4 mark in overtime, a 1-1 record in shootouts. The team will continue its three-game road trip when they take on the Stockton Heat at Stockton Arena, where the puck is scheduled to drop just after 7:00 PM PST.